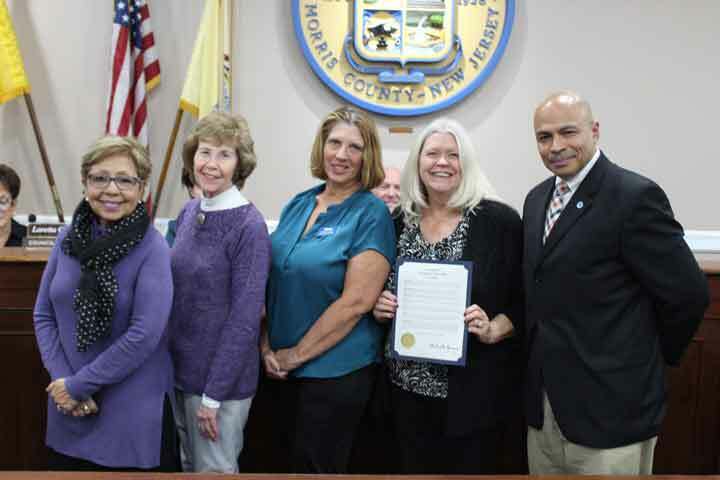 At the November 20th Town Council Meeting, Parsippany Mayor Michael Soriano presented the Woman’s Club of Parsippany-Troy Hills (WCPTH) a Proclamation for National Adoption Month. Court Appointed Special Advocates (CASA) of New Jersey is the latest State Special Project adopted by the New Jersey State Federations of Woman’s Clubs (NJSFWC). CASA is part of a national network of non-profit programs that advocate for children removed from their families because of abuse or neglect. CASA recruits and trains community volunteers to be a “voice in court” for children removed from their homes due to abuse and/or neglect. Community volunteers are trained to “speak up” for these children, helping them get the services they need and ensuring that they find safe, permanent homes. CASA programs operate in all 21 counties in New Jersey. National Adoption Month is an initiative with a goal to increase national awareness and bring attention to the need for permanent families for children and youth in the U.S. foster care system. With a CASA volunteer dedicated to their case, these vulnerable children have someone speaking up for their best interest. Photo Caption: Woman’s Club of Parsippany-Troy Hills club members listen as Parsippany Mayor Soriano reads the Proclamation for National Adoption Month.